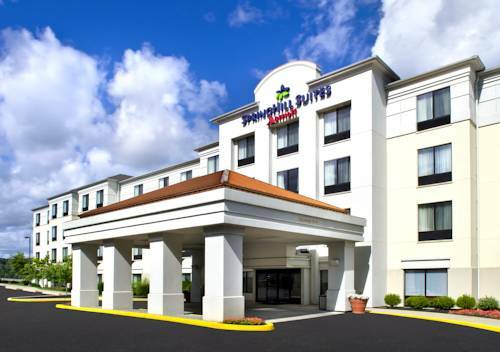 Unwind in style at SpringHill Suites Danbury. Located off of I-84, our hotel in Danbury offers convenience to popular area attractions in Ridgefield, CT and Brewster, NY. Just a short drive away are top destinations including Western Connecticut State University, Brewster Ice Arena and Ives Concert Park. Back at the hotel, enjoy expansive guest suites with semi-separate living and sleeping areas in addition to complimentary high-speed wireless Internet access for 24/7 connectivity. As the sun rises, fuel up at our complimentary breakfast buffet with hot and cold morning favorites, or get energized at our indoor swimming pool and on-site fitness center with free weights and cardio equipment. From arrival to departure, our staff at one of the premier hotels near Brewster, NY works tirelessly to ensure that you and your group enjoy all of the comforts of home while experiencing the quality of a Marriott hotel. Whatever brings you to town, book a suite at our hotel in Danbury, Connecticut today! Animatronic displays and a glass-fronted milk-packaging assembly line help distract you from jostling shoppers. Giant museum collection includes the motorcycle Charles Lindbergh traded for his first airplane, a police bike from JFK's assassination motorcade, and three "Wall of Death" thrill show motordromes. 48 feet tall, made of metal, she's the Holy Mother Church's rival to the Statue of Liberty. Several places claim to be the birthplace of America's favorite meat-on-bread combo, but only here can you actually eat a 19th-century-style burger.